This article from The MagPi issue 72 explores Carsten Dannat’s Squirrel Cafe project and his mission to predict winter weather conditions based on the eating habits of local squirrels. Get your copy of The MagPi in stores now, or download it as a free PDF here. Back in 2012, Carsten Dannat was at a science summit in London, during which a lecture inspired him to come up with a way of finding correlations between nature and climate. “Some people say it’s possible to predict changes in weather by looking at the way certain animals behave,” he tells us. “Perhaps you can predict how cold it’ll be next winter by analysing the eating habits of animals? Do animals eat more to get additional fat and excess weight to be prepared for the upcoming winter?” An interesting idea, and one that Germany-based Carsten was determined to investigate further. “On returning home, I got the sudden inspiration to measure the nut consumption of squirrels at our squirrel feeder”, he says. Four years later and his first prototype of the The Squirrel Cafe was built, incorporating a first-generation Raspberry Pi. So, how do you know how many nuts have actually been eaten by the squirrels? Carsten explains that “the number of nuts eaten per visit is calculated by counting lid openings. This part of the source code had been reworked a couple of times to get adjusted to the squirrel’s behaviour while grabbing a nut out of the feeder. Not always has a nut been taken out of the feeder, even if the lid has been opened.” Carsten makes an assumption that if the lid hasn’t been opened for at least 90 seconds, the squirrel went away. “I’m planning to improve the current design by implementing a scale to weigh the nuts themselves to get a more accurate measurement of nut consumption,” he says. Just nuts about the weather! The big question, of course, is what does this all tell us about the weather? Well, this is a complicated area too, as Carsten illustrates: “There are a lot of factors to consider if you want to find a correlation between eating habits and the prediction of the upcoming winter weather. One of them is that I cannot differentiate between individual squirrels currently [in order to calculate overall nut consumption per squirrel].” He suggests that one way around this might be to weigh the individual squirrels in order to know exactly who is visiting the Cafe, with what he intriguingly calls “individual squirrel recognition” — a planned improvement for a future incarnation of The Squirrel Cafe. Fine-tuning of the system aside, Carsten’s forecast for the winter of 2017/18 was spot-on when he predicted, via Twitter, a very cold winter compared to the previous year. He was proven right, as Germany experienced its coldest winter since 2012. Go squirrels! 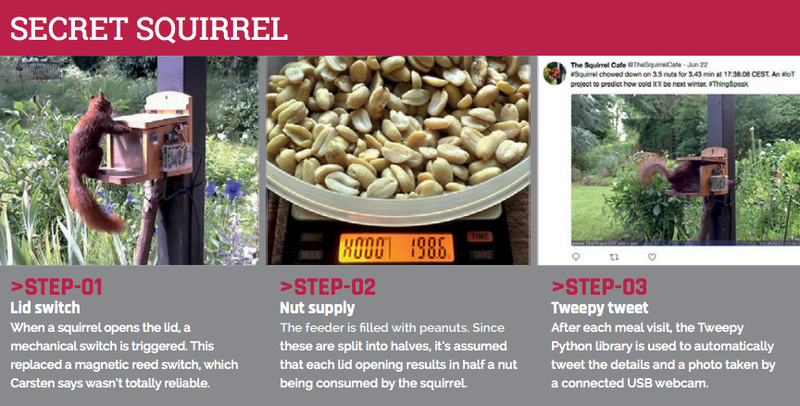 Track the eating habits of the squirrels through some utterly adorable photos on The Squirrel Cafe Twitter account, and learn more about the project on The Squirrel Cafe website. our broken window has been replaced and the dining area was subject to a redecoration. We apologize for any inconvenience caused by a raccoon on Friday night. Spot sneaky squirrels in your garden!